The Port of Valencia or known as Valencia Port to build a terminal of the future, 4 container terminals with a capacity to serve ultra-large vessels of up to 24,000 TEUs. 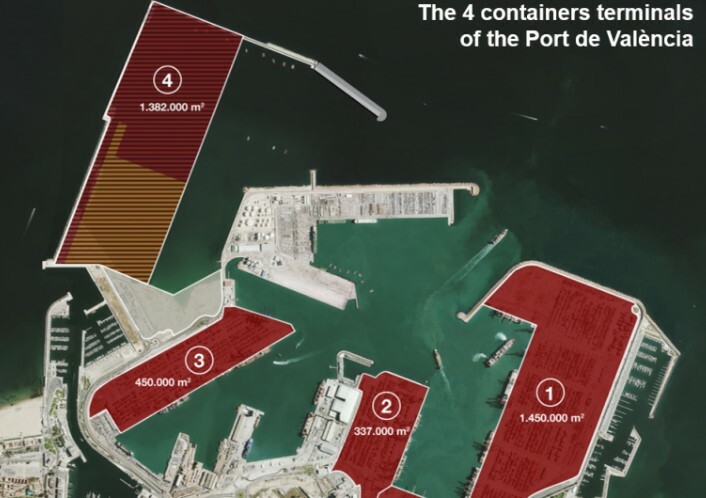 According to WMN, the board of directors of the port has approved the project that paves the way for the tender of the construction and operation of the port facility, which once completed its construction, would be the fourth and largest container terminal in the Port of Valencia. Currently, there are three terminals in the Port of Valencia: Noatum Terminal, MSC Valencia Terminal, and APM Terminals. The initiative is in line with the expected growth of the volume of container traffic in the port of Valencia by the year 2050. The port project is described as a new and appropriate development as an automated terminal since the port requires state-of-the-art equipment for sustainable operations. Another prerequisite is excellent connectivity to the import/export and transshipment markets, which allows the terminal to position itself within the mixed port market. The port authority said it would provide the future concessionaire with a berthing line of up to 1,970 m long with a draft of 20 meters along and for the entire dock, an adjacent yard of 137 hectares, as well as a maritime access channel with a draft of 22.50 m.
The wharf would be granted under a 35-year concession for the occupation offers of the partial concession, with the possibility of extension of up to 50 years. Another option is a 50-year concession for offers that contemplate the total occupation of the dock and the adjacent area needed for the proposed terminal. The terminal must cover a minimum of 800 m. of berthing line and 49 hectares, and it has to be at least semi-automatic. It is expected that the contract for the construction of the terminal will be awarded in July 2019.